← Is there a civil war in Iraq? Since Friday is a traditional cat-blogging day, I thought I would contribute an update to show how one of our pets is settling in after these last mad months of house construction. It seems as though there is a universal need for a space of one’s own. It doesn’t have to be large, just big enough where we can get out of the way and have a little time for ourselves. 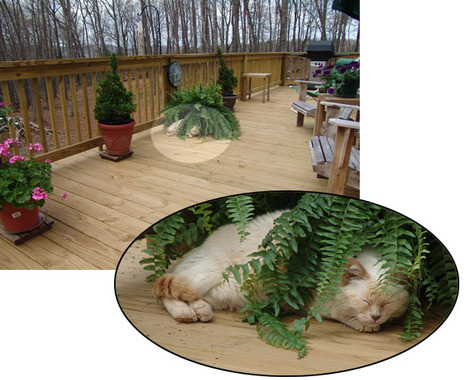 Buffy is quite grateful that our deck finally has enough plants to provide shelter. I hope that you also get a little time for yourself today, not necessarily for napping like Buffy, maybe just enough time to plan your future and make important decisions. Happy Friday! I love the photo! Maybe I should make Fridays dog days? Thank you for your letter and link. I love this picture, and the way you’ve shown the enlarment – very nice! Glad to see that the settling in is going well! I’m still fighting WordPress at the new blog, but decided I needed to swing by blogroll buddies and say howdy! Hope you have a terrific weekend – the weather in the KC area is spectacular!